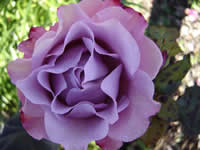 Angel Face is a truly stunning lavender colored rose that is sure to make itself at home in just about any location you choose in your garden. 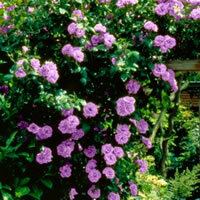 The exquisite blooms will reach 3 to 4 inches in diameter and have ruffled edges that are just wonderful. Angel face also a terrific fragrance that is sure to impress your friends and neighbors when they come over to visit. Angel Face roses are not the tallest climbers you'll ever find but you can expect them to reach upwards of about 10 or 11 feet tall at full maturity. Depending on how to prune them and shape them, they will spread out about 2 to 4 feet across, so make sure you give them plenty of room to grow and don't crowd them in too much. Don't be surprised if this variety tends to get a little leggy at the bottom, the taller it gets. Angel Face will do very nicely in zones 4 through 9. Angel Face climbing roses love full sunlight and they will do their best if you can give them a location that gets at least 6 to 8 hours of direct sun each day. Most roses will grow and stay healthy in a partial shade spot, however you may find that they never seem to live up to your expectations in the end. Roses are not a hard plant to grow, but I have found they tend to be a little more particular than most. The drainage of the location is also crucial to the survivability of your Angel Face climbing roses. 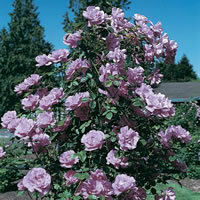 If the soil does not drain well then you will probably find that your roses seem to get mildew or blackspot easily. Good air circulation is key to helping prevent diseases among your roses. Give your plants adequate space between each other and place them somewhere in your garden that gets good airflow. When you water them, try to water only the base of the plant rather than the leaves. This helps keep them dry and healthy and they are less susceptible to disease. Depending on where you buy your Angel Face roses from, you are either going to get them in a container, or as a bareroot plant in early spring. As a container plant the root system is already established, however if you get yours as a bareroot, then you will have to plant it properly to give it the best chance possible of growing healthy and strong. The first thing you will want to do is dig a hole that is much larger than the container, or the roots fully extended. I always suggest to folks that they keep a bag of a good organic compost on hand for when they start planting. No matter how good your soil is, it can always be a little better and it never hurts to mix in a little compost when you are backfilling the hole. Before setting the plant in, mound up a little soil in the center of the hole and place the plant in, with the union bud just an inch or two below the surface of the soil. Carefully lay out the roots all around, being careful they aren't bent or folded, then backfill with your soil and compost mix, making sure to water it down halfway through so that the soil properly settles around the roots. Angel Face climbing roses can be cared for much the same way most roses are. You can give them a regular feeding schedule that usually involves a dose of fertilizer in the early spring when the foliage starts appearing, another dose during the first bloom cycle, and them many growers suggest the third feeding sometime around mid-july to help promote additional bloom cycles, provided you are properly deadheading along the way. As for a watering schedule, in most circumstances Mother Nature will take care of this for you, however if you feel like you are in a dry spell and your roses aren't getting enough, a good rule of thumb is to give your Angel Face roses a good watering about once a week or so. If your area is in an unusually long dry spell, or the weather is extremely hot, you might want to consider watering every 4 to 5 days instead. Just keep an eye on the wetness of the soil and make sure you are not overwatering. Roses absolutely do not like sitting in constantly damp soil. If you decide to grow roses, I always suggest to folks to make sure and invest a couple dollars in a generous layer of mulch around their roses. Angel Face climbing roses are no exception to this. Mulch provides numerous benefits that I've discovered often go overlooked by novice and experienced gardeners alike. I always hear how much of a pain it is to mulch every year and why not just plant perennial ground cover to do the job? Why that might seem like a good idea, there are several reasons why you should mulch. First off, mulch provides a barrier between the soil and your Angel Face roses. Diseases and pests can lay dormant just on the surface of the soil waiting to attack your plants. When you water them, or even when a heavy rain comes through, these undesirables can splash up onto the leaves of your roses and cause serious problems. Mulch helps prevent this. Mulch also will help retain water, allowing you to water less and avoid overwatering. A generous layer of mulch around the base of your roses will go a long way throughout the growing season, so don't overlook this important step.